For those visiting (or even recently re-located) to Bangkok, here are some tips that you will not find in any guide book (and I doubt you will find most of these tips online either). These are some simple but useful little tips for enjoying your time in Bangkok that much more, that I picked up from living there. Today’s post will start this series off. 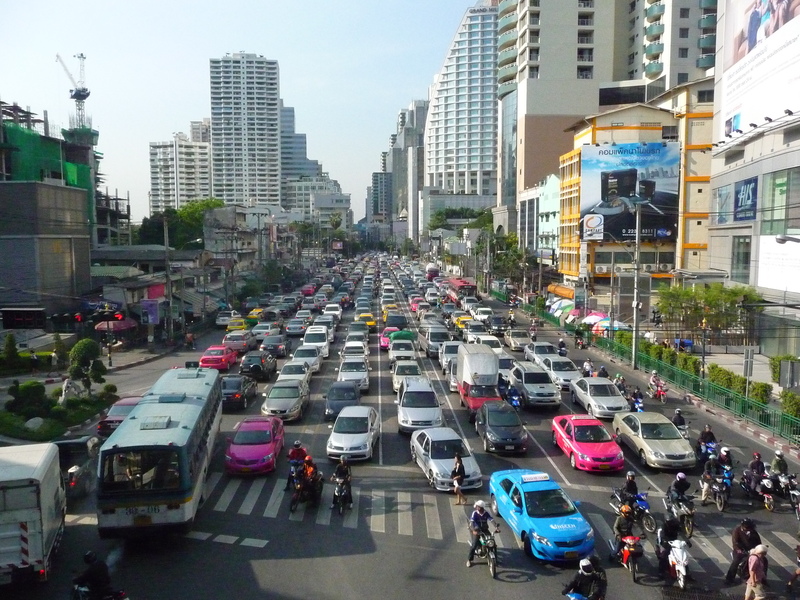 As you can see from the above photo, Bangkok can get really congested… and its not just the roads, but the sidewalks can be a real nightmare too, with shopping stalls, motorbikes, food carts, hazardous paving and, of course, pedestrians, all creating their own little traffic jam. Therefore, especially in downtown Bangkok, you may want to avoid walking on the footpaths. It is possible to get from MBK (Mah Boon Krong) shopping centre, all the way to Central Chitlom (1.5km away) without setting foot on the pavement (and without cheating by taking the skytrain either). I will describe how to do it, but at the same time, I also take the opportunity to give you some background about the different places you will pass by. As such, this becomes a bit of a walking tour of the main sites in the shopping district of Bangkok. The starting point is MBK shopping centre (located at the intersection of Ploenchit/Rama I Road and Phayathai Road; or get off at the National Stadium stop on the Sky Train). MBK first opened in 1985, and continues to be the most popular shopping centre in Bangkok, selling everything you can think of, plus having lots of food options and entertainment such as movie theatres, bowling and video games. From within MBK, get onto the Sky Walk (either exiting via the 3rd Floor North East exit; or if in Tokyu department store, then the 2nd floor North exit). Head East on the Sky Walk away from the National Stadium skytrain stop (and don’t litter in this area, because this is where the litter police like to hang around). You will hit a t-junction where the Sky Walk stops and you can either cross to the right which will take you down to the pavement of Siam Square or left which will take you to a staircase heading up into the third floor of Siam Discovery Shopping Centre. Head up into Siam Discovery. Siam Discovery opened up in 1996 and at that time, its focus was to be an exclusive high end shopping centre focusing on luxury brands and what was then Thailand’s best cinema. In more recent times it has reinvented itself slightly and the cinema is replaced with a Madam Taussaud’s wax museum and there was until recently an ice skating rink on the top floor. The restaurants on the higher floors offer great views over Bangkok. Once yo get inside Siam Discovery, take the escalator up one level to the fourth floor. If you look towards the East, you will see a Starbucks… walk past it, keeping your heading East and you will discover a plexi-glass enclosed bridge/tunnel that crosses over to the next shopping centre. Go through the tunnel and you will find yourself inside Siam Centre. Siam Centre is Bangkok’s oldest air conditioned shopping centre. It opened in 1974 and has always been a central hub for fashion. These days, this is a great place to view the offerings of some of Thailand’s best designers, as well as some of the harder to find international brands. The top floor is also good for food, with a nice food court. From the tunnel, you should find yourself on the top floor of Siam Centre (you should see a Sizzler to your right). Take the escalator down one level and keep heading East. At the North East corner of the store, you will see a Teddy Bear Cafe, glass doors, and escalators that go down half a level. This will lead you to the court yard in front of Siam Paragon. Okay, some of you will now try and argue you are now on pavement… sorry, but you are wrong. Your are on an elevated section. You could actually have exited one level down as well, in which case you would have been on street level (well, half a floor above it). Instead, you are now in the court yard where the owners of Siam Paragon host special events such as concerts, shows, fairs, etc. Chances are there will be something happening as you pass by (I rarely see this square empty). From here, head across the square into the main entrance of Siam Paragon. Siam Paragon is one of the newer shopping centres in Bangkok and currently the most high end of Thailand’s shopping centres. In the basement is Ocean World, a large walk through aquarium. The ground floor is possibly the largest food hall in Thailand (and most crowded) and the top floor contains the best cinemas. There are plenty of high end stores selling luxury brands, including Lamborghini. Anyway, after you are done window shopping, get back to the main entrance and walk due East until you get to the exit (South East). You will know it because it leads to the Siam Sky Train station. Once you exit out of Siam Paragon and you are heading towards the Sky Train station, keep walking South (towards Siam Square) past the Sky Train gates and you will eventually notice a small walkway at the end that continues heading East (but now on the opposite, Southern, side of Ploenchit Road). Follow this old walkway over Henry Dunant Road and past the beggars and souvenir sellers and eventually you will find the walkway links in with the Sky Walk again, which sits directly under the Sky Train tracks. Follow the Sky Walk East. Eventually, you will have the option to veer off to the left (just before Ratchadamri Road intersection) which will take you into Central World. Central World is currently Thailand’s biggest shopping centre (and one of the biggest in the World). It offers a lot of the same sorts of stores as Siam Paragon, but is a little less luxury brand focused (no Lamborghini). It also has great restaurants, a food court and cinema on the top floor and you can access the tower which will take you to roof top restaurants offering high altitude views over Bangkok. There is also an ice skating rink at the North Western end of level 2. Assuming you are still on the Sky Walk out the front of Central World, then keep heading East, across Ratchadamri Road. As you cross over the road, you will see some Thai dancers on your right hand side around a shrine. This is the Erawan shrine (the statue is of Vishnu) and was built because during the construction of the original hotel, there was a lot of misfortune (and quite a few construction workers died due to unfortunate accidents). The Thais believed this was due to the construction work disturbing the local spirits of the area, so the Erawan shrine was built to give the spirits a nice home. As you near the Erawan shrine, on your left hand side you will notice another shopping centre. This one is Gaysorn Plaza and seeks to be another high end luxury mall. Unfortunately, it is quite small compared to Siam Paragon and doesn’t have the selection. There also aren’t many dining options within. As a result, this mall tends to be very empty, which is perfect for those seeking a bit of peace and quiet. Just after the Sky Walk entrance to Gaysorn Plaza, and after Erawan on your right hand side, you will see Amarin Plaza, which is characterised by white Roman columns in the front. On the ground floor is the original branch of McDonalds in Thailand which opened in 1985. Originally, this shopping centre was built around the Sogo department store, which will explain why there are now large empty open areas in the back (where the department store used to be). These days, this place contains mostly Thai souvenir places, but there are some interest items available. Back on the Sky Walk, heading East, you will notice the walkway starts to rise up and narrow, as it leads into the Chitlom Sky Train station. Here you have two options. If you want to remain true to the tour and not hit the pavement at street level, then you can use your sky train ticket (you do have an all day pass don’t you?) to swipe through the gate. However, instead of going up the stairs to the sky trains, just keep walking East until you reach the next set of gates, at which point you swipe again to exit. If you don’t have an all day pass, take note that you will be charged for swiping in and swiping out again (5 or 10 baht from memory). If you don’t have a sky train ticket or don’t want to spend the money, then instead of going through the gates, back track until you get to a set of stairs on the Northern side that heads down to street level. You should now be in front of the Intercontinental and Holiday Inn hotels. Keep heading East until you find another stairway heading back up to the sky train. This should be in front of the electricity generating authority, and there is usually a pretty good orange juice vendor here. You should now be in front of the Eastern gates of the Chitlom skytrain station. Continue East until the Sky Walk ends and turn left up a half storey of stairs leading to the entrance to Central Chitlom. Central Chitlom is the premiere department store for the Central Group and is the largest department store in Thailand (one of the largest in Asia and I think is still the largest in South-East Asia). It first opened in about 1980 but has been significantly remodeled since then and has an excellent selection of items on sale. I tend to do most of my clothes shopping here. On the top floor is a great upper end food hall with great views over Bangkok. As an FYI, once the shopping centre (Central Embassy) next door to Central Chitlom is completed, I suspect it will be possible to access this centre as well without setting foot on paving. I hope you enjoyed this little guide. Often when I am playing host to overseas visitors to Bangkok, I take them on this little tour, and they really appreciate the convenience of being able to shop in luxury surroundings with minimal toll on their comfort.